We released a small update to the Community Events module tonight that allows residents to browse prior community events. 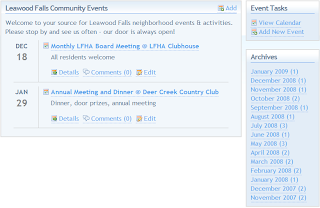 On each Community Events page there is a new Archives tile on the right of the page that provides links for each Month / Year and indicates the number of events for that month - i.e. December 2008 (2). Clicking the link will display all of the events that occurred in the given month. Below is a screenshot to better illustrate. Hope this helps! Thanks and we will see you 'round the neighborhood!